Awhile back, I mentioned the possibility of making Discipline my one-word for 2017. In many ways, it would be a good word for me, as I want to redevelop lost healthy habits and establish strong routines. As the new year approaches, though, I’ve come to reconsider that word choice. Discipline carries too much of a punitive connotation. Given how much I’ve beat myself up these last few years, I don’t want to give myself a word that might fuel the self-chastisement. At the same time, I really do miss the discipline I built for myself from 2011 to 2014. I loved that my default was healthy, be it exercise, food, stress relief, or coping techniques. I miss the way my body and brain felt back then, and how much easier I adapted to challenges – physical and mental. After several weeks of thinking, a light bulb went off in my head: NURTURE. To nurture is to care for and protect, but also to support, foster, and encourage during a period of training or development. I really, really love this idea: to care for myself while simultaneously creating the structure and habits I need back in my life. I came to see it like an art metaphor. Discipline felt like taking a block of stone and chiseling away pieces to create a sculpture, whereas nurture feels like molding a sculpture from clay. Neither is a better method for creation when viewed objectively, but the artist will gravitate toward one or the other. Right now in my life, it is nurture that I need, the act of building something wholly new rather than breaking away pieces to find the art within. The end product may be the same, but the process to get there is very different, and I’m choosing a new path for myself in 2017. 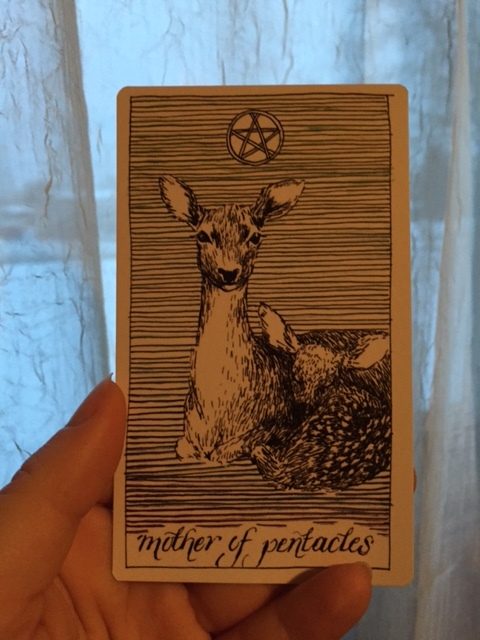 This entry was posted in Wellness and tagged goals, tarot, Wellness Wednesday. Bookmark the permalink. Sounds like a great plan. Hope 2017 is great year for you and your family! That’s a great word and perfect for you. I look forward to seeing how you incorporate it into your life in 2017! Hopefully I’ll actually be able to incorporate it, heh. Let’s make it great for us both! Oh boy, just reread my comment nature vs nurture I guess!! Like so many of the bloggers I’ve read so far with their One Word, I like how you differentiate between the word you thought about using and then the one you finally chose. In your case, that is the difference between chiseling and molding. Somehow your comment got caught up in my spam filters and I just now caught it. Sorry! Chiseling and molding. How funny that two things so different can also be so close. No worries. I have comments from regulars that once in a while get caught in spam too. I have no idea why. I selected the word NOURISH for many of the same reasons. I considered nurture as well, but in the end, nourish sounded softer to me (the “sh” at the end reminds me to keep the negative voices in my head at bay). I wish you much success in the new year! Ooh, I like your little sh!